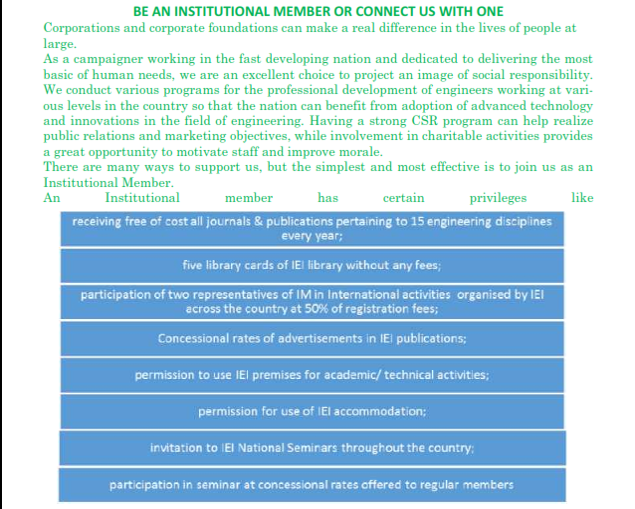 Becoming a member of IEI is very simple. Desirous person has to fill in the prescribed form- which is available free of charge . (application forms for T & ST grades are at Rs. 25/-) at the Head Quarters as well as Centres, get copies of necessary certificates, get the form signed by supporters and submit to either HQ or Centres with membership fees as mentioned below. THE INSTITUTION OF ENGINEERS (INDIA).